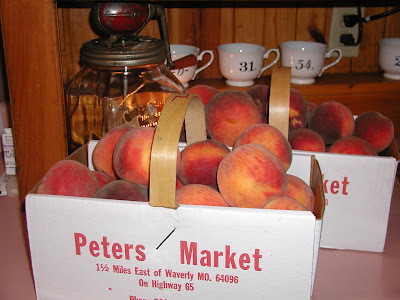 My dear friend, Winnie, and I went to Peter's Market and got some beautiful peaches. I've been wanting to freeze some because I have an empty freezer and need something to put in it. It takes a lot of energy to run a large freezer empty, so Winnie and I have decided to enjoy the produce available this fall and share the freezer. I filled a large pot with water and set it to high. 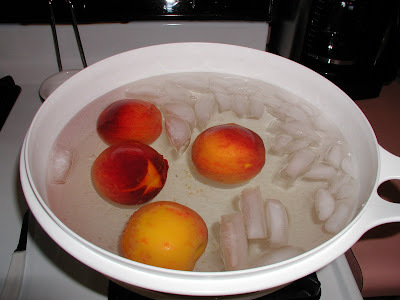 Once the water was boiling I dropped in some peaches and left them for 30 seconds. 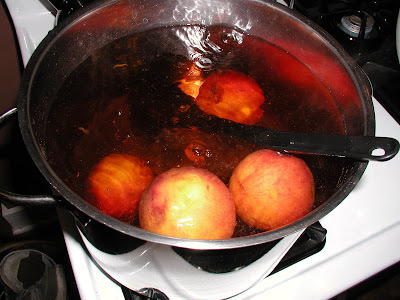 I transfered them to ice water and the skins then peel right off. Slice them and add 1/4 teasp. 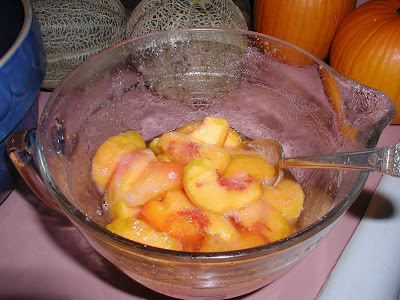 of Fruit Fresh to 1/4 cup of water and pour over the peaches. Then add 2/3 cup of sugar and stir. I then placed them in quart size freezer bags and ended up with 11 quarts of peaches. Alright, I would have had an even dozen quarts if I hadn't eaten a few that just didn't seem up to par! and made this: (Recipe is in the new Midwest Living magazine. My mother is in the hospital and I will be taking a break for a while. She had a total knee replacement on Tuesday and that's why I haven't posted lately. She'll need lots of help and prayers for a quick recovery so I'm off to do both! Hugs to you all and enjoys the scents and beauty of the approaching autumn season! I was hoping you'd paint a lovely pie picture. Hi Catherine, I'll be right over for a slice of that delicious looking pie...maybe with some vanilla ice cream?? That is just my favorite. I wish your mom a speedy recovery! The fruits look yummy. Autumn is right around the corner! We are still loving our painting!! I am planning on grabbing a BIG bunch of peaches tomorrow at the market (I forgot last weekend). I hope all goes well with your mothers recovery, your in our thoughts. Cathie, those peaches and apples all looked so yummy! Good luck to your Mom-hope she heals quick! Ugh! I wish that I could make a pie! I hope that your Mother is doing well, and I wish her a speedy recovery! The pies look so yummy!. I thought you had painted a peach pie. LOL. I will miss your posts while you are away tending to Mom. I'm sure she will enjoy your help and company. I hope she recovers quickly and is feeling better everyday. This all looks so good Cathy. 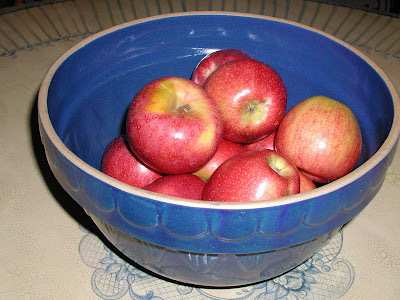 I think we should take a trip to Illinois for apples. We never got over there for peaches, but did by IL peaches from a truck,here in town. Just as good but not the same as going to the orchards. I'll keep your mother in my thoughts and prayers. The fruit looks amazing. I hope your mother does well and you can come back and update us. Take care! Prayers for your mom's quick recovery. Knee surgery is no picnic. That pie crust is so cute. I hope that I can remember it when I make another pie. Those peaches and the pie look yummy. I had a total knee replacement on March 30 and I was outside trimming shrubs today and digging with that leg on the shovel. I'll warn you the first two months were scary and I wondered if I would ever get better. If your Mom does her exercises and has physical therapy, she'll get along great. Please give her my best wishes for a speedy recovery. I LOVE frozen peaches! My fave is to eat them while they are still slightly frozen so they melt on the tongue like sorbet. So yummy! 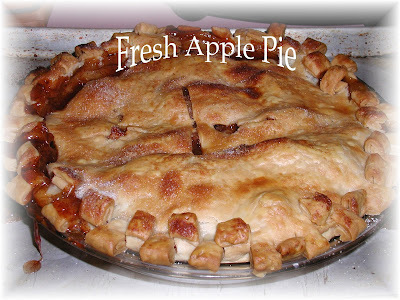 That apple pie looks divine! I could eat a piece right now. And I love peaches, they will taste so good this winter. Hope your mother is doing well. Wishing her a speedy recovery. Thank you for the peach how to! I love putting cut up apple slices in the freezer for winter pies, but I may have to do the same with the bounty of peaches and nectarines we have this year! Lovely blog, I enjoyed my visit with you so much! I wish your mum will be very good , everything will go well and both of you, will not remember anything about the surgery soon! Thank you for your great words on my blog...You will always welcome if you and your family want to have a holiday in Turkey some day...I have a summer house which is empty almost whole year!!! Thanks so much for stopping by and leaving me a sweet comment, it really means a lot to me since I am so new to this blogging thing. What a blessing today to hear from you! Wishing your mother a speedy recovery. Yummy post! Thank you for the congrats Catherine! I am on cloud nine right now! !